We’ll start out with a thorough 55-minute Initial Evaluation in which we will complete a detailed postural assessment and introduce you to the fundamental Pilates principles. Then, utilizing the knowledge we gained in your initial evaluation, we will begin to utilize the Pilates principles in your 2 private sessions, working on the mat and varied apparatus to strengthen, lengthen and tone your entire body. This is a great way to get started (or get started again) on your Pilates journey. Start out with a thorough 55-minute Initial Evaluation in which we will complete a detailed postural assessment and introduce you to the fundamental Pilates principles. Then we will utilize this knowledge we gained as you continue your work with the added energy and camaraderie of fellow Pilates practitioners. This is a great way to get started (or get started again) on your Pilates journey. We are so excited about our newest Team member, Leslie Snyder. Book 3 privates with her for only $180 (a $75 discount) from now until June 20th! We'd love to welcome you to Bolder Pilates. Please read through our Frequently Asked Questions below to help you know what to expect at your fist visit, and feel free to call us if your questions aren't answered here. New to Pilates? We recommend starting with an Initial Evaluation appointment, and some private sessions, even if your goal is to enter group classes. The learning curve is very quick, but it’s truly a different language, and we want to make sure you learn the RIGHT way (for YOUR unique body) from the start so you get the most out of your workouts. We have some wonderful New Client Specials (at the top of this page) for you to take advantage of that offer a great discount and will give you a great jumping off point. 1) Requesting an Initial Evaluation - even if you have prior experience, this appointment allows us to look at your body and come up with a program that works for your body’s specific needs and your goals. If you are working with an injury or have chronic pain, we highly recommend starting here. 2) Requesting a Private Session (“appointment”), or a group class, whichever fits your needs. We always prefer to see people one on one (but this is not mandatory) before group classes so we get a chance to learn about you and your body...then we can help guide you to the appropriate class. Download the MindBody app to make scheduling with us as simple as possible. Favorite us on the app and then you can schedule both private appointments and group classes with a just a touch. You can also sign up for classes by clicking our schedule on either our web site or mobile, which will direct you to the MindBody scheduler. If you do not have a MindBody account, you will need to register for one. CAN I START PILATES IF I’M INJURED, IN PAIN, OR GENERALLY OUT OF SHAPE? Absolutely! * This is the perfect time to start your Pilates program. Pilates is inherently rehabilitative, focusing on proper structural alignment and correcting muscular imbalance in the body. We specialize in a therapeutic approach, and our passion is teaching you the tools IN the studio to help you live the boldest life you can OUTSIDE the studio. *If you are recovering from surgery or a serious injury, we recommend having your Doctor’s approval before starting any exercise regimen. Noooooo! Pilates was created by a man, and is greatly beneficial to just about anyone, of any age or of any size. In fact, at our studio we have about 40% male clients. It is absolutely the best method for creating strength from the inside out and a deep awareness between body and mind. Professional athletes, both men and women, have been using Pilates to stay strong and injury free for decades. What are you waiting for? For information on private and group classes CLICK HERE. To see all of our specials, CLICK HERE. Wanna make booking with us a breeze? 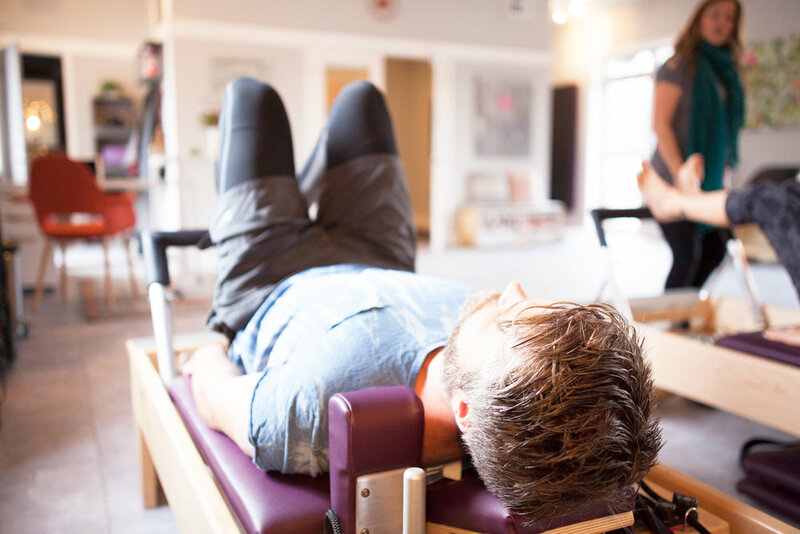 The easiest and fastest way to register for services with us is to download the MINDBODY app onto your smartphone, search for “Bolder Pilates” and then favorite us. Then we’ll be right there at your fingertips!